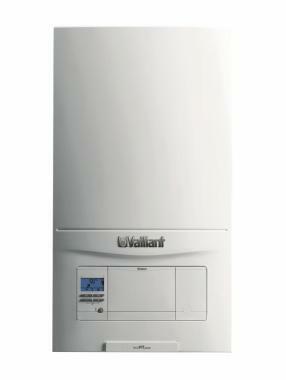 The EcoFIT pure is a combi condensing gas boiler by Vaillant. This boiler is wall mounted and ultra quiet in operation with it being quiet mark-approved. You can be sure you're getting a reliable boiler with it coming with an output of 25kW and an efficiency rating of 89% making it a B rated boiler. This boiler is a flexible boiler with a small footprint. This boiler comes with a top and rear flue option on all boilers in the range thus allowing for flexible sitting and making it perfect to fit in a wide range of property types. With it also being a compact boiler this means it's able to fit in a standard sized cupboard making it easy to hide away. This boiler comes with a clear LED display making it perfect to see where lighting may be limited. With this boiler being easy to install as well as maintain with it having accessibility layout that helps for all components to be replaced from the boiler front as well as coming with recognisable Vaillant fault codes making it easier for you to find the problem with your boiler in the unlikely event of it going wrong. This unit comes with a high specification aluminum heat exchanger which is designed so the unit lasts longer, can be maintained easier and helps to reduce the energy bills. Another great thing this unit comes with is its high quality components helping to offer peace of mind for the lifetime of the product. As well as this it comes with industry leading flue lengths of 10m across all of the EcoFIT range. This boiler has a 4 sided cooling and agitation of the heat exchanger, helping to reduce the stress on the heat exchanger to help the boiler have a longer life, better reliability and another great way to reduce the maintenance cost. This boiler is compatible with Vaillant's range of intelligent controls this giving you another way to make the boiler even more energy efficient than it already is as well as save you even more money than you can already save. This boiler comes with 5 years warranty to give you peace of mind that you have brought a reliable boiler.